Realty Website Packages from iNET image, inc.
iPACK Realty complete website package for Real Estate Professionals includes everything you need to showcase your business and yourself online, complete with a five page website, first year of domain registration, unlimited updateable property listings, and first month of Value Hosting service. iPACK Realty is available in two custom-designed model options, one for Real Estate Agents and the other for Real Estate Agencies. And Much Much More, with No Contract! This is not a do-it-yourself website. Our professionals do all the work. Successful Real Estate Professionals understand the value of an Internet presence. It is by far the most economical way to make your real estate listing information public, manage your properties, and communicate with prospective clients. (It is also, incidentally, one of the most searched subjects on the Internet.) The iPACK Realty complete website package makes website management easy and affordable for all real estate professionals. Simply choose one of our website designs, submit your information to be included on the website, and we create a website for you with two business days. Best of all, you'll be able to update your website information from your own computer whenever you choose at no additional cost! With an iNET Realty RealTime Package, we do it all for one low set-up price plus a low monthly hosting fee. You select a domain name and we will register it for you for 1 year. Pick a website design from our web look library. Provide us with your information (photo, logo, text and pictures you want on your website). Our professionals create your website within two business days after receiving your complete information. Your website will consist of a home page, real estate listings intro page, and three additional pages of your choice (and of course, unlimited real estate listings pages). 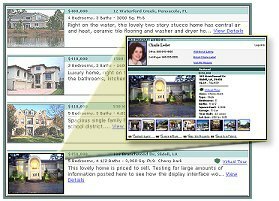 This powerful tool will allow you to completely manage all of your real estate listings online. Add, edit, or delete a listing in minutes. Enter as much or as little information about each listing in real time. Display up to 9 photos to showcase each property. Manage panoramic virtual tours such as IPIX. Manage thousands of property listings online for one low monthly price.